But how do we talk about the term ‘freedom is happiness’. Freedom to me is the right to preserve my culture, practice my religion and to maintain my Tibetan way of life. It goes without saying that Tibet is nation with its own unique history, way of life, and abundant cultural heritage that goes back over millennia. However, today’s Tibet [under China] has no freedom. It has become a place where we have to bury our tears as sorrows gnaw from inside. In 1959 His Holiness was forced into exile and the Communist China declared so-called liberation of Tibet during which hundreds of thousands of Tibetans were killed and many more were imprisoned. But how can it be called the ‘Peaceful Liberation of Tibet’? Sacrificing his personal safety and privileges Panchen Lama wrote his historic 70,000 Character Petition in 1962, for which he was denounced as a ‘feudal lord’. Later he was imprisoned for nine years and eight months. Basic freedoms were and are non-existent in Tibet. This was clear from imprisonment of a very important figure like the Panchen Lama for simply speaking the truth. This is 2009. If we reflect on the last 50 years — a book published in exile clearly stated that ‘China is always for the Chinese. Chinese authorities always consider Tibet as its enemy. They do not want the His Holiness Dalai Lama, the Tibetan culture, religion or Tibetan traditions. China only wants Tibet’s natural resources’ — I think this is true considering Chinese policies in Tibet such as the birth control, supression of religion, population transfer etc. which are aimed at eventually eliminating the very Tibetan identity. As Tibetans, we should seriously think about this implication. The lack of freedom and suppression of religion in Tibet can be seen from the cases of Gyalwang Karmapa and Arjia Rinpoche. Unable to work for the welfare of the Tibetans, they went into exile in search of freedom that would guarantee them an environment to work for Tibetans. China’s suppression of Tibetans has two levels. The first is the more tangible one in terms of physical harassment of anyone who speaks about the situations in Tibet today. Using tools such as ‘engaging in political activism’ and ‘holding wrong political thoughts’ those who speak the truth are persecuted. This is done by sending soldiers and other security personals all over Tibet, who use modern weapons to arbitrarily arrest and force people to live in constant fear. Thus freedom of thought is denied. The other level of suppression is subtle and less tangible in the form of denial of political rights and declining economic situation, and the destruction of Tibetan culture. There is discrimination in education where Tibetans schools are never taught subjects such as science and arts in the same standard as are taught in the Chinese schools. Tibetans do not get professional skills and equal job opportunities. This is a political scheme to disempower them. There is also a dangerous trend to sinocise all aspects of Tibetan way of life. Throughout Tibet farmers are driven into urban towns and nomads are forced into permanent settlements. Additionally huge number of Chinese settlers is brought in whereby Tibet’s unique culture and traditions are permanently destroyed. At such a critical time, we cannot remain silent. We must speak. In an essay I read earlier that it was written that ‘it’s great if we all laugh together, and it will be courageous if we all cry and die together.’ We must speak the truth. It makes me unbearable to witness all these deceptive policies and wrong the education system in Tibet. I am now in my twenties, but personally I have never experienced a situation where a Chinese solider pointed a gun at my head. I have also not experienced ill-treatment from a Chinese. However, as a Tibetan living in Tibet, the sufferings my fellow Tibetans face are my own sufferings. 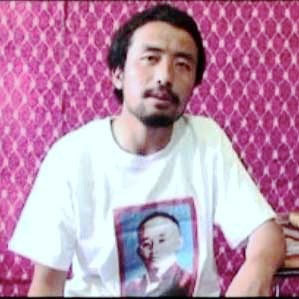 Lobsang Tashi [Tapey] from Ngaba in Amdo province sacrificed his life for his country, people and their rights after the local authorities banned religious ceremonies. Recently a monk from Ragya Monastery also took his life due to severe restrictions on religious freedom. Likewise, Pawo Thupten Ngodup in exile also self-immolated to demand freedom for Tibet. There are thousands of Tibetans being tortured in Chinese prisons. All of them have the same vision for a free Tibet, where we have political freedom, economic rights and freedom to protect our culture. The majority of Tibetans are cowed down by suppression, fear and crackdowns by the Chinese authorities. A few even think that we have all to lose and nothing to gain. But deep down every Tibetan has resentment and grievances stored in their hearts. Sometimes it is believed that a few people speaking will not make a difference. Yet given the fact that our culture and identity faces life and death struggle, we have to stand up. Drawing inspirations from the examples set by Gunthang Jampalyang, who refused to accept the Chinese appointed Eleventh Panchen Lama, and Khenpo Jigme Phuntsok, who dedicated his life in the preservation of Buddhist culture, we must speak. Today, I am here speaking about these things not because I am a scholar but because my flesh, blood and bones are inherited from my Tibetan ancestors. And the Tibetan language has given me food, shelter and fame. I can no longer bear the situation in Tibet. People are dying and there is no time to wait. Everyone must speak. This is also true for those who work for the Chinese government. Since their fate is linked with rise and fall of the Tibetan nation, they must work for the people’s happiness. Realising that thousands of Tibetans sacrifice their lives for Tibet, those who work for the Chinese must have the courage to tell the truth. This was what the Indians, under the leadership of Mahatma Gandhi, did against the British and they won independence in 1947. If we follow their example, it is likely that we will also win freedom soon. His Holiness is turning 74 now, and has been working tirelessly for more than 50 years for Tibet. As the Tibetan saying goes ‘old man longs for his home and an old bird its nest’ and likewise His Holiness too misses and longs to come back to Tibet. This is the sole wish of all the Tibetans in and outside Tibet. For this to happen even if we have to speak against the barrel of guns, we must do so with total conviction and courage. We are a new generation who work for truth and justice despite the fact that the authorities are willing to take more and more Tibetan lives. We are very committed to protect truth and justice. [That is why] I am standing here today. Similarly, many books published in Tibet such as Shar Dung Ri (Eastern Snow Mountain), Tsenpoi Nyingtob (Fierce Courage), Na Shon Sarpa (New Generation), Ngai Phayul Dang Shiwai Chingtol (My Land and ‘Peaceful Liberation’) as well as other publications in exile strongly express the sufferings of Tibetans under the Communist rule. It is not that we cannot carry violent activities or that we are incapable of doing so. Many have sacrificed their lives for Tibet and hence it is not that we do not have courage or the means. But under the leadership of His Holiness the Dalai Lama we fight for justice through non-violence. We will never resort to terrorism as is being done in other parts of the world. We have also no plans to avenge the hundreds of thousands of Tibetans who were murdered. Yet looking at today’s situations of the farmers and nomads, then it is worth sacrificing one’s life. In this way, I have the willingness to sacrifice my life for Tibet when a circumstance requires and I will have no regrets. If all of us remain united and think likewise, we will realize our common aspiration. It is not necessary for all of us to take to the streets for Tibet with our fists raised in the air. Through writing we can tell the truth about the real situation in Tibet. Today I am here, in spite of the danger, hoping that that my voice will reach those who are inside Tibet and around the world. Everyone has the responsibility to talk about right and wrong. If one is a lama, then he has the duty to tell the truth and if one works for the government, then he must speak the truth because his salary is tiny compare to all the sacrifice people are making. If the Tibetan students know that the education system does not provide them the necessary qualifications they can boycott by not attending classes. Likewise, Tibetans must stop using Chinese clothes and stop eating Chinese food. If think in this way, it is not necessary for all of us to take to the streets raising slogans. We do not hate the Chinese people, but we respect truth and justice. We are against the Communist China’s rule. Premier Wen Jiabo said that China respects truth and facts. If this is so then why is that I as a Tibetan do not have freedom learn my language, promote my culture and practice my religion? This is why lamas, monks, government officials, students and all other lay and monastic people must engage in civil disobedience by boycotting in all their respective works. Is it possible to boycott in all activities? The fact is that all the patriots who march forward ready to sacrifice their lives do so for Tibet and the Tibetans and never for any personal gain. If they can sacrifice their lives for Tibet, then we can certainly boycott in our works. For the past 50 years we have suffered under the oppression. Each time we humbly submit an appeal, the authorities do not accept it. In fact today anyone who tells truth is considered as a criminal, though it is the China rule that is criminal. Moreover, the Chinese authorities call His Holiness ‘a wolf in monk’s clothes’ and his followers ‘Dalai clique’ and ‘separatists’, which deeply hurt the Tibetans. How would the Chinese people feel if we take down the portrait of Mao Zedong from the Tiananmen Square and trample on it? Taking down His Holiness’ photos, burning and tearing them have caused deep wounds in the Tibetan hearts. If a genuine friendship is to be build between the Tibetan and Chinese people, then His Holiness and the Tibetan Government-in-Exile must be allowed to return and engage in genuine talks with them to solve the issue of Tibet. Only then a true harmony between the people can be built. Otherwise, no matter how many times the Chinese government talks about harmony and peace, they will remain just empty words. His Holiness is well-known around the world, everyone respects and honours him. But His Holiness is 74 years old and he must miss his homeland very much. It is the wish of every Tibetan for His Holiness to return to Tibet and negotiate with Chinese leadership in peace. However, the Chinese authorities do not treat the Tibetans as human beings, and deny us the right to revere His Holiness, or even call for his return. It will cause a great heartache for every Tibetan if His Holiness passes away in exile because the bond between the Tibetans and His Holiness is like a child to a mother. Many worry that Tibet will face the same fate as that of Manchuria. This is what the Chinese government wants. Taking this historical opportunity, Tibetans in and outside Tibet who share a common aspiration, must be able to to sacrifice their lives for justice and happiness of the Tibetan peoples. The crackdowns on artists and intellectuals are increasing. The authorities ban all types of publications because they know that these would clear people's minds and reveal the wall of lies the government propaganda has built. I'm here today to express the pain I feel inside due to the Chinese rule. I am neither a good speaker nor very knowledgeable. But the pain inside me pushes me to speak out the denial of freedom in Tibet. The images you see in this video are testimonies to sufferings of the Tibetans under the Chinese rule. Generally, I write essays and books about the situation in Tibet. However, since majority of Tibetans [in Tibet] are illiterate, I chose to make this video appeal so that even a shepherd in the hills can hear it. Finally, the Tenth Panchen Lama said that ‘I will never engage in a single tiny act in my life that will harm the courageous and hard working people of Tibet,’ and that ‘Until and unless I am able to clear this impression of backwardness in the Tibet people, I will not close my eyes even in death.’ Drawing inspiration from our leaders such the Panchen Lama, we must have vision for a united Tibet and to preserve our culture and speak in pure Tibetan. We must not engage ourselves in petty issues. These are my final appeals.